Shortbread cobbler? Yes. Many times I have had cobblers that are much too sweet. Where's the balance especially if serving ala mode? This is the cross-over, my shortbread cobbler. As we move spring into summer, the rhubarb is in full force. The tart taste reminds me of childhood. My mother would tell me to run out back and grab a few 'sticks' of rhubarb for a cake/dessert she would make. I have 4 rhubarb plants that edge my garden and boy are they producing like gangbusters right now. What better way to use them then in this cobbler shortbread! For the filling combine the sugar and flour. Add the rhubarb and berries just to coat, pour into backing dish (you can use a 9X9 or 7X13or 12x12). Take the cubed butter and dot across the top. Sprinkle top with vanilla. In separate bowl, mix the crust. Mix all ingredients and mix with a large fork until it starts to form a loose ball. Take pieces and flatten them a little laying them over the berry mix in the pan. Continue until you've covered the top and used all the cobbler topping. Pop into oven for 40 minutes. Serve warm with vanilla ice cream. I call this a Jam Jelly because it is! Some of the pulp while straining comes through with black currants. That's great for the product and intensity of flavor. It's also great because it adds structure and pectin. Black currants are one of the few berries that contain a high level of pectin so you don't need it to make it set. I had a customer drop off two quarts of black current pulp/juice when they picked up their pork. I love little surprises like that! I immediately had a plan for the gorgeous purple liquid. Jam Jelly! Black currants are very tart. I think the right ratio of sugar to berry juice is 1:1. I had 7 cups juice (used one of the cups in a bubbly purple water kefir- to die for!) so I would then need 7 cups cane sugar. Congrats on the deer if you got one!! This recipe incorporates un-rendered lard and venison to make a wonderful, well flavored sausage. Mix all ingredients except water together in a large bowl. Let sit 20 minutes. Run through a meat grinder on the largest dial setting. I prefer the largest because mushy sausage is not as desirable. After getting all of the sausage mix ran through the grinder, place in mixer bowl plus the 1 cup cold water and mix on low for 1 minute EXACT (I use my kitchen aid for this, but you can also just use a hand blender or any standing mixer). This creates a beginning emulsion and marries the flavors together. After mixing, package in 1 lb 'loaves' wrap with saran wrap and place in freezer bags. Keeps up to 1 year. You can also create sausage links/brats with adapter and hog intestines if you chose to from this point with this recipe. An Italian savory, meaty flavorful soup. My family particularly loves this especially this time of year, fall. The ingredients coincide with the garden calendar year perfectly. Cook sausage in large soup pot till done. Remove from pot and set aside. I like to leave the pan drippings and fat in, drain if you'd like. The benefits from lard are plenty, very high in Omega 3's, especially if you buy organic or non gmo sausage. Saute bacon (till crispy), garlic, and onions in sausage fat. Add all ingredients EXCEPT cream and Romano cheese to soup pot. Bring to a medium boil till the potatoes are done (25-35 minutes). Lower heat, add cream. Serve in bowls, grate fresh Romano on top. Wonderful served with crusty sourdough bread. Silly good. Say it again.....silly good. These are super fantastic by themselves, with ice cream or topped with fresh whipped cream and a sprinkle of cinnamon. Don't waste the juice! If you are a martini fan, pour equal parts grey goose vodka with the syrup juice left in the jar and throw a couple peaches in with a splash of lemon. Bo YEA - homemade peach martini! Ok, so on with my recipe. I tried several different alcohols with these fresh peaches I canned and I think spiced rum was the best... I think. I did sample quite a few and may have become a bit shnockered by the time I picked ;) There isn't a lot of alcohol per pint, but just enough to excite your taste buds and enhance the natural peach flavors. A super dose of antioxidants in this cucumber salad. 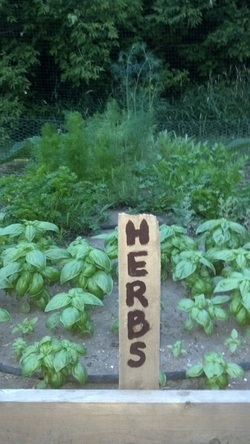 All the ingredients are fresh from the garden making it cost effective and easy to put together. whisk together until it emulsifies, pour over salad- enjoy immediately! Wonderful with pizza or served with a grilled chicken breast, salmon, or flank steak. Yum kale! We all love kale around here and it's a good thing given the health benefits it provides to us. I sell my different varieties of kale (Toscano, Red Russian & Siberian) at the local farmer's markets and am quite often asked how I like to prepare it. These are my top five ways I've found to be super delicious. Heat oil in saute pan on medium. Just as the oil melts add the garlic clove- 30 seconds later add the kale. When finished sauteing, approx. 3-5 minutes. Add seasoning to taste after sauteing. I love this served under a nice grilled fillet of salmon, walleye, or grouper. * You can also add cooked sliced beets to this to make it more filling as a side meal if you are gluten free and not serving it with a starch. 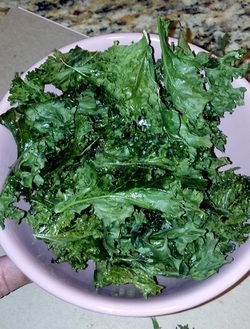 Combine kale, carrot, red wine vinegar, salt and pepper. Stir very well. Add bacon to pan, cook till crispy. Remove, chop and add to other mixed ingredients. Cook onion in bacon fat just till they are cooked through, add to the kale mixture. Also add mayo and honey. Stir until well combined. I like to serve this with burgers, brats or typical summer grilled food. Preheat oven to 350. Rip kale apart into bite size pieces leaving the bitter stem. Place on baking sheet lined with parchment paper. LIGHTLY drizzle with olive oil and LIGHTLY sprinkle with sea salt and a tiny bit of onion powder (you can also just use seasoning salt, soy sauce or garlic powder). Place in the oven for 10-12 minutes. Ready when cooled :) Enjoy your power snack! Two large handfuls of chopped kale to a white bean and ham soup is super delicious. Traditionally, kale is added to Zuppa Toscana - the wonderful sausage soup served at Olive Garden but you can add it to any broth based soup to add some awesome nutritional value. Combine all ingredients, toss with Italian dressing. When life gives you dandelions and wild violets- you put em in a jar to enjoy on toast, crackers, or pair with cheese and wine. Plus, I love foraging. Finding food out your doorstep, naturally grown- untouched is such a treat. We had all these dandelions pop up so I had my little ones pick the heads of the flowers and see who could get the most in 10 minutes...makes short of a task that would take me much longer by myself. So, while they were busy, I foraged through our woods to find the precious, delicate, beautiful wild violets. I thought they would pair nicely since neither one is over powering and should compliment each others flavors. So, here's my take on an old fashion dandelion jelly. Pinching the green underneath petals to release the dandelion petals easily. 2 quart jar size- full of stemmed dandelions. I pinch the bottom of the flower that's green to remove it and take just the petals. Place water, dandelion petals, lavender buds, vanilla bean and violets in large stainless steel pot. Bring to slight simmer for 15 minutes. Strain liquid from petals. Continue to strain until no petals or debris are in liquid. I put mine through my French press to get a good strain. Add to liquid in stainless pot lemon juice, lemon zest and pectin. Bring to boil. Add sugar. Continue to boil for 3-5 minutes. Depending on thickness. It will appear runnier than jam of course. But resemble typical jelly. Ladle into warm/hot/clean pints or half pints. Hand tighten lids and rings. Hot water bath for 10 minutes after boil. Especially wonderful with Chevre Goat Cheese on crackers. Also delicious on morning toast or English Muffin served with strawberries/fresh fruit. Yes and Yes. This is such a great 'pastry' to bake in the evening and serve in the a.m. with a hot cup of Jo or tea. This recipe is easy to manipulate into your own liking- want to make an apple butter, strawberry or pumpkin coffee cake? easy peasy, just insert the sweetened preserves, jams or butters where I have my blackberry preserves listed. Done. Preheat oven to 350F. Grease a 9" spring form pan. Yes, you should use this, it will make your life easier. Fork together flour, 3/4 C can sugar, and butter until it well mixed and resembles small peas. Remove 1 1/4 cups of mixture, set aside. To remaining mixture add soda, baking powder, salt, sour cream, almond extract, and 1 of the eggs. Mix until just combined. Spread batter into greased spring form and make sure to get up the sides at least two inches. You want to create an edge or crust for the filling to sit inside of. Beat cream cheese 1/4 cup cane sugar, and last egg. Spread on top of batter, try to get some up to the edges. Now spread your preserves on top. Don't mix it in, just lay it evenly on top. And don't be perfect, that's what makes this 'cut' look so pretty. Imperfections. Combine the reserved crumbs and almonds, spread on top. Bake for 45-50 minutes. Top should be a light shade of golden brown. Cool 15 minutes, then take the spring form sides off. STARE it down and let sit another hour in the fridge. Drizzle top with combined powdered cane sugar and drops of vanilla extract. Delish! Be sure to stun someone with your awesome creation. I am always adding healthy tidbits to all our meals around here and since milk kefir ferments so fast, I always have lots on hand. That's when I came up with my 'Milk Kefir Pancakes.' Not only are they healthy- they are delicious- kind of like buttermilk pancakes but with whole wheat. Best Crock Pot Chicken Ev-ah! Succulent doesn't even begin to describe the moist, juicy chicken you get with my crock pot chicken. Should be called crack pot chicken. This recipe fills the house with the smell of wholesome goodness and turns the meaning house, into home. Combine the dry spices and onion juice in a bowl. Rub all over chicken, under skin, and in the cavity. Pour chicken stock on bottom of crock pot and lay onions over stock. Do not add any more liquid. Lay herbed chicken on top of onions, cover. Cook on high for 3-4 hours depending on size of your chicken. Mine is a 4.5 lb chicken (nice size) that I raised myself. If you can get a free - range chicken DO. There is a difference in flavor. Chicken is ready when meat falls off the bones. Also known as liquid gold in my house. Chicken stock is an amazing item to have in the pantry or freezer. It's an awesome base for soups, braising veggies, slow cooking meats, chicken gravy, risotto, rice, quinoa and the list goes on... When you bake a chicken, keep the carcass (bones, skin and fat drippings). Stash in a freezer bag and add more chicken carcasses until you get two-three of them saved up. 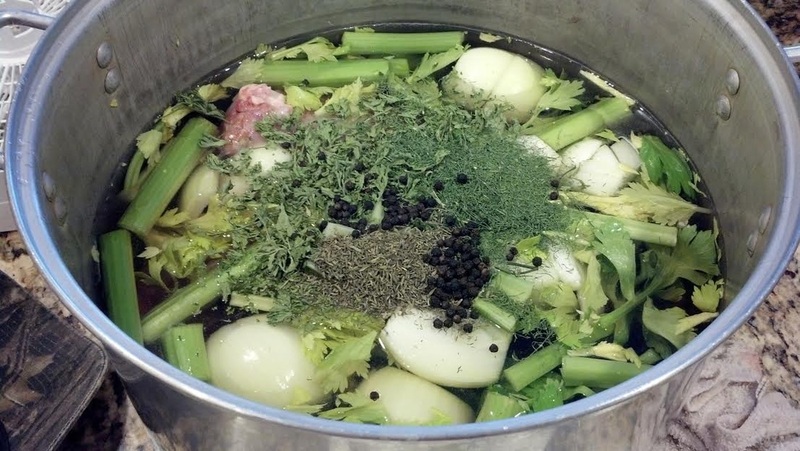 Once you have enough, you are are ready to make some chicken stock. Here's what you'll need to make my Liquid Gold Chicken Stock: yields 8 quarts approx. Cover all with water. Water should come above all ingredients by about 3-4". Bring to a boil on stove. Once it comes to a boil reduce to a low simmer for 4 hours. Shut off stove and let cool. Once it has cooled (I like to make my stock at about 5pm, cook till 9 and let cool over night) take the fat layer off the top, if there is any. Discard- or use for cooking veggies in! Strain out the big chunks of veggies, bones, etc. and immediately store in airtight containers and freeze. OR if canning, after done straining, heat stock on stove just to heat through, in warmed/washed quart jars pour stock into each one with 1" headroom. Wipe rim of jar, place new lid and ring on each and fingertip tighten. Place in PRESSURE canner (has to be pressure canned to avoid botulism) with three quarts water, seal lid on canner. REFER TO YOUR PRESSURE CANNER USE INSTRUCTIONS. Can at 10lbs- pints: 2o minutes & quarts: 25 minutes. Personally, I'm a canning fan. Love the convenience of walking into the pantry to grab a jar instead of taking up room in my chest freezers. But freezing works great too. Enjoy your liquid gold!!! 3. Add the honey into the pot and stir. Simmer 30 minutes. The longer it simmers, the thicker it becomes. This recipe does not have sugar or pectin therefore, takes longer to get thick and is more like a fruit spread. 4. Hot wash jars. Add the hot, boiled ingredients to the jars ½” from the top. Place lids and rings on. 5. Water bath for 10 minutes. Take off heat and let sit for 5 minutes. Remove from hot water bath. Set on counter for 24 hours before using. **Make it extra special by adding a length wise cut vanilla bean for Vanilla Honey Strawberry Jam- delicious. Be sure to take it out when you fill your jars. Water kefir, if fermented correctly, will be a fruity, fizzy drink. 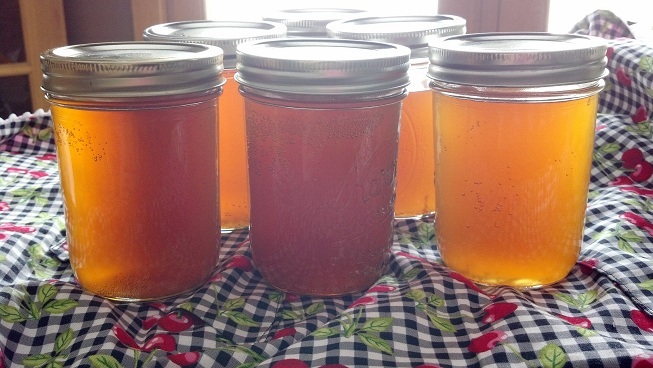 A fermented drink that gives almost instant gratification (see health benefits on blog). In the winter, it takes longer to ferment than normal but typically takes 24-48 hours for the first ferment. The following is my recipe how I like to ferment it! Since water kefir has a quick turnaround, I recommend fermenting a quart at a time. 1-2 Tbl Water Kefir Grains - no you cannot re-create these, you will need to purchase them from a place that sells them. Bottle into glass jars with 1/4 cup fresh, or frozen blended fruit and cap tightly with air tight lid. Leave on counter from 1-5 days, tasting each day to see what level of 'fizz' you have. If, to your liking of fizz, put into fridge to stop fermenting process and take out to drink when you like. Keeps in fridge up to 2 weeks. My favorite flavors are simple: I just place fresh or thawed fruit into blender: Peach, Strawberry, Blackberry, Peach Ginger, & Pear. You can really get creative with the second ferment. Just stay away from honey (will kill your grains, it's an anti-microbial). When finished with the first ferment you must do a new ferment with the kefir grains at this point otherwise you will starve them, or damage them because they have nothing more to eat. You can put them in the fridge with fermented liquid and 1 tsp cane sugar but placing them in the fridge more than a couple times a year can be detrimental to them. They like to eat, constantly. * With my sugar, every other ferment on my water kefir grains I switch my sugars. Water kefir likes new minerals, I use Turbinado cane sugar (sugar in the raw), and white cane sugar. I alternatate between the two. And about every 10th ferment, I add 1/2 tsp molasses to the sugar water mix for extra minerals for the kefir grains. It keeps them healthy. Cheers! To a fabulous, healthy drink! If you like apricots this is a fantastic, thick apricot butter that is fermented for 3 days, with honey. I love it. Ok, so it doesn't need to be Christmas in order to make this, but it certainly is a crowd pleaser! I love this during the winter months as it's a little pick me up and the ingredients are easy to find or on hand. This buttery, lemony bread is excellent in the morning with a cup of coffee. 1/4-1/2 tsp water, until it incorporates and drizzles from a knife or fork easily. There is nothing like homemade sausage. You control the salt and ingredients which makes it a healthier option for breakfast, soups, or stuffing! After tweaking this recipe several times, I believe this to be a winner. If you don't like any 'spicy' to your sausage omit the red pepper flakes, but it is NOT hot spicy, just gives it a little extra. 1. Mix all ingredients in large bowl. Let sit in fridge 30 minutes. It is important to make sure the meat is very cold before processing through a meat grinder- it goes smoother and quicker. 2. Take out of fridge and send through meat grinder on small die cutter. 3. Place ground meat into mixer bow, add 1 c cold water and mix on medium speed for 1 minute. NO LONGER. 4. Roll into links, patties, or a log and freeze immediately. Use some immediately too if you desire. 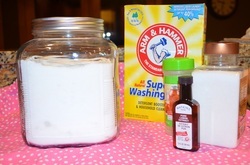 Super easy fabric softener that does a wonderful job. The scent of the essential oils come through very little, the reason for using them is because the ones on my list are antibacterial, naturally so adding them cuts down on the stinky little microbes in your laundry. Vinegar is also antibacterial and helps to soften clothing. 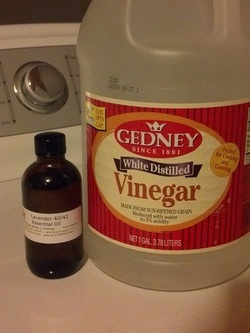 How: pop the top off the gallon vinegar pour 2 T. essential oil in, pop the top back on, shake. Done. And shake before each use too. Simple, affordable and natural without chemicals! Ahh, yes. Fall. The smells alone will have you ready to bake something. This is my moist pumpkin bread. It fabulous with a slab of butter and drizzle of honey or plain by itself. Try this recipe for your family, guests, or both and they will be back for more...including you! Makes 2 loaves. Pre-heat 350F. 4 Tablespoons coarse white sugar/cane sugar for sprinkling on top. 1. Oil 2 9X5 bread pans. 2. Mix first 5 ingredients. Add remaining ingedients, mix to get clumps out and no more. 3. Fill bread pans3/4 of the way up. Add pecans or walnuts to one pan none or both. If you do, mix them in gently with your finger. 4. Sprinkle top of mixture with 2 T sugar for each pan. 5. Bake 60 minutes or until knife inserted into middle of bread comes out clean. Enjoy with butter and honey or by itself :) Happy fall baking! Oh, and do right before someone comes over for that overwhelming, awesome fresh baked 'home' smell. I love apple crisp- but it either has too many apples and not enough crumbles or vice versa. I also like mine with oats- delicious oats caramalized by the sugars and butter. And what better season to make apple recipes than fall? For a 9X9 baking pan. Preheat to 350F. Drizzle olive oil in the bottom of the pan. Dump apples on top of oil. over the top of the apples pour lemon juice, sugar, cinnamon, nutmeg and vanilla. Give a light toss, just so you don't have clumps of spices. In separate bowl, combine all ingredients for the topping. With pastry cutter or fork smush ingredients until pea size balls form- do not over mix. Equally place over the top of the apple mixture in the pan. Bake for 50 minutes. Excellent served ala mode! Happy apple season! Combine all ingredients, stir to mix all. Put into airtight container. Done. Yes, it's that easy. 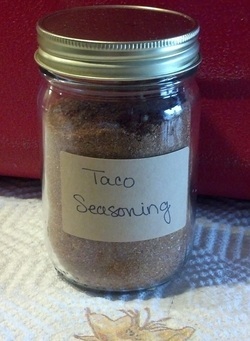 2-1/2 T = one packet of taco seasoning. Chemical free intense hair moisturizer. Start massaging from the ends all the way to the scalp. Do this 1 to 2 times a month to get super healthy hair! mix in saucepan on very low heat, melt oils together. Once shea butter melts, remove from heat and place in container to use when you want. This is 1-2 applications. I like to use it when it is a little warm, I feel like it distributes better. Let it sit for 10+ minutes. The longer the better. Wash the floors, vacuum, clean whatever then shampoo and condition as normal. Waa La! Shiny stronger hair. These are so awesome on crackers and cheese, tacos, or a topper for homemade nachos. Fairly easy to can, anyone can do it with a surplus of hot peppers. I used all jalapenos in this recipe but you can use any hot pepper or combination of. 1. Prepare jars and lids in hot sudsy water. 2. In large stainless bowl combine vinegar, garlic, water. Bring to a boil- reduce heat and simmer for 5 minutes until garlic has infused the vinegar. Discard garlic. I sometimes keep my crushed garlic in. 3. Pack the peppers into warm jars. Ladly hot liquid on top of the jalapenos in their jars leaving 1/2 " headspace. Wipe rim and hand tighten lid on each jar. 4. 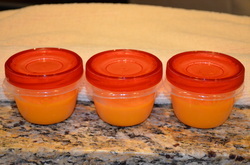 Place jars in canner (water bath can) ensuring they are completely covered with water. Bring to a boil, time 10 minutes after it starts boiling. Remove from heat, wait 5 minutes. Remove jars, cool, store. Pre-heat waffle iron. If making the freezer version, make sure the size waffles you are making fit into the toaster. Whisk wet ingredients, first five, in large bowl. Beat in remaining ingredients 1 at a time until complete mixture is smooth. Brush waffle iron with olive oil spray or any cooking spray you prefer. Pour batter into waffle iron. Cook until waffle iron lights up or the waffles are crisp golden brown. Remove, eat OR line on cookie sheet to cool. Place wax paper between layers and freeze. Once frozen, bag. Take out and use as needed always putting remainders in freezer. :) Serve with fresh preserves, honey or maple syrup. ENJOY! I love sweet potatoes! And what's more important is that they are super awesome for you-, containing carotenoids, fiber, beta-carotene, potassium, and vitamin C. Other than mashing them with cinnamon, brown sugar, butter and nutmeg -- this is the perfect way to serve them. With the outside a little chewy these salty sweet fries are easy to make and are great anytime of the season. Preheat oven to 450. Cut sweet potatoes into fry sticks. Place on baking sheet and drizzle with olive oil, toss to coat. sprinkle with paprika, salt, pepper, and garlic powder. Do so in that order - I prefer not to mix all of the ingredients together but to do them separately. That way, every bite is different. Place in oven for 16 minutes. Take out and flip, place in oven for another 12 minutes. I like mine a little crispy chewy, but if you like them on the softer side only do 10 minutes on the second round. What a fantastic way to use those ripe eggplants in the garden! Preheat broiler. Place eggplants on baking sheet, rub with 1 Tbls olive oil. Broil 15 minutes, rotating every 5 minutes. Transfer eggplant to a large bowl and let cool. Once cooled, peel and stem. Rough chop 1/3 of the eggplant. Food processor the remaining until smooth. Add the remaining 1/8 c olive oil and the lemon juice, tahini, garlic, cayenne, and salt. Puree. Transfer to a small bowl and fold in the chopped eggplant. Garnish with parsley, serve. Best served with fresh Naan. My favorite recipe for Naan is from (I don't use the kalonji but I do use the fennel seed. Buttered pecan ice cream is probably in my top ten. But when you make your own...it is OUT OF THIS WORLD. The buttery, salty pecans combined with the silky cold cream makes for a perfect summertime treat. Directions: 1. In bowl whisk together sugars, vanilla, salt and milk until sugars are dissolved. Stir in heavy cream. Cover and refrigerate for 4+ hours. 2. Melt butter in skillet over low heat. Toast pecans for 4-5 minutes. Sprinkled with salt. Set aside to cool completely. 3. Pour contents of sugar/milk mixture into your ice cream maker (follow the manufacturers instructions for your unit). Mix until thickened, about 15 minutes. With machine running, add pecans. Mix 3-5 minutes. Transfer to airtight container and place in freezer for 4 hours. (It never makes it to the freezer in our house. We eat it right after mixing!) Enjoy!! 1. 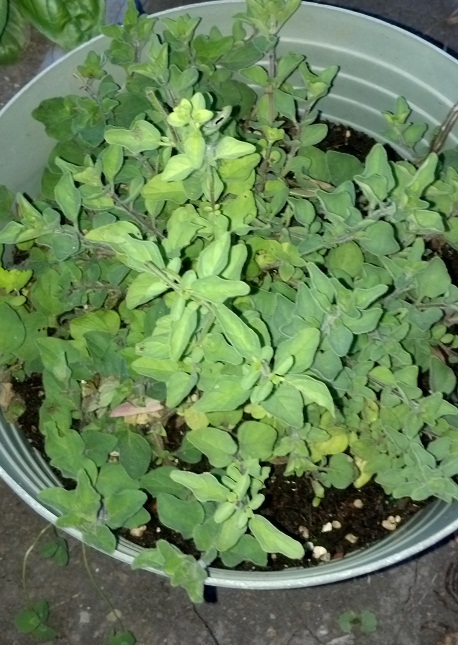 Rinse them in cold water getting the dirt off the leaves. 2. Lightly dry with paper towels or soft dishrag. 3. For drying, you can either use a dehydrator or lay out flat on dry paper towels (some people even hang their herbs in bunches to dry). If you dry in a dehydrator it can take up to a day to dehydrate 4 levels of the herbs. If you lay out to dry, it can take up to three weeks before you can airtight container them. 4. 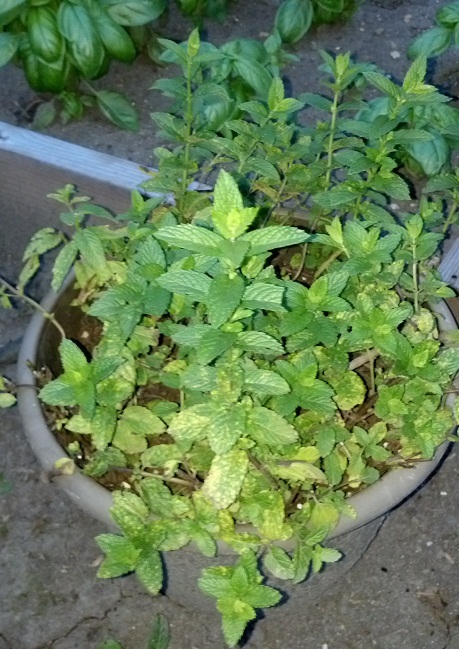 If you airtight container any herbs and there is a little but of moisture in them still, they will mold. Be sure to dry them until they crumble easily. 5. After dehydrating, I place mine into a zip lock baggie and crumble them and then pour the pieces into designated containers. 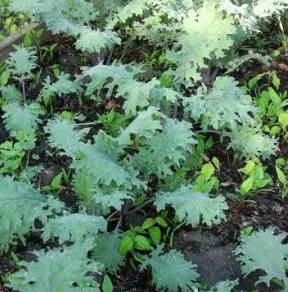 Kale has flooded gardens and the Farmer's Markets. 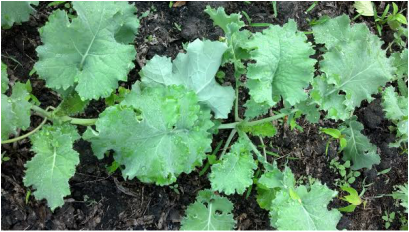 Besides salads, stir frys and sauteed- what else can you do with Kale? Make them into amazing powerful chips! Here's how. Preheat oven to 350. Rip kale apart into bite size pieces leaving the stem. Place on baking sheet lined with parchment paper. LIGHTLY drizzle with olive oil and LIGHTLY sprinkle with sea salt and a tiny bit of onion powder (you can also just use seasoning salt, soy sauce or garlic powder). Place in the oven for 10-12 minutes. Ready when cooled :) Enjoy your power snack! Known in Mexico as the three milk cake, Tres Leche is a sweet, moist, creamy treat- and also a great way to use up some eggs. 4 oz butter (1 stick) room temp. Preheat oven to 350. Lightly oil and flour 9X13 pan. Set aside. Whisk together flour, baking powder and salt in bowl, set aside. Place butter into the a bowl to whisk. Whisk for 1 minute. With the whisk running on slow, gradually add sugar over 1 minute. Add eggs one at a time, incorporating each one. Add the vanilla and combine. Add the flour mixture in three batches. Not all at once. Transfer the batter to the prepared pan. It will appear to not be very much batter, spread over entire pan equally. Bake in middle of oven for 21 minutes. Remove from oven, cool 30 minutes. Poke holes all over the cake with a fork. Mix the glaze together in a quart and pour all over the cake. Set in fridge overnight. In the morning (or when you get to it) mix the topping ingredients together and whisk until stiff peaks. 5, 1 cup plastic containers with lids. Combine strawberries and sugar. Let stand 10 minutes. Mix water and sure-jell in saucepan bring to a boil stirring constantly. Continue to boil 1 minute. Add to fruit mixture. Stir 3 minutes. Fill plastic containers immediately. Fill 1/2 inch from the top. Cover with lids. Leave on the counter at room temp for 24 hours. Ready to enjoy! Freeze for up to 1 year. Keeps in fridge 5 weeks (yay right, it won't last that long). This tart and creamy strawberry frozen yogurt will satisfy the taste buds. Especially great sitting on the porch swing on a 85 degree day. My homemade yogurt recipe is at the beginning of the recipes scroll down. Be sure to use Greek yogurt or your frozen yogurt will be icy. Blend your strawberries in a blender. I like mine really blended. Makes it really pretty. Pour into a bowl with the sugar. Mix- set aside for 2 hours. Add remaining ingredients to the strawberries. Mix. Cover and refrigerate overnight (or 6 hours). Using an ice cream maker, pour ingredients into the ice cream makers bowl and follow the manufacturer's instructions. In mine, I pour ice around the canister and rock salt. I let it churn for about 30 minutes or until the machine shuts off cause it is too thick to churn anymore. Ours doesn't make it to the freezer because its just so good, but store in an airtight container in the freezer. SO refreshing! Here's my ice cream maker. Simple, great reviews and does the job. You do not need to be a gardener to enjoy this awesome sore muscle soak but this time of the year, many are very sore from planting their gardens. Relax and heal yourself with this easy recipe. Want to make your own quality soap? This is a great, basic recipe to get you started. First, freezer paper line a soap mold. If you do not want to purchase one, a bread pan, long skinny glass pan, etc. will work fine. I use an old cedar shelf that has four compartments exact in size. It holds about 80 oz total. I cut 4 oz bars therefore, I get 20 bars of soap from my soap mold if I use it's full potential. If you have the silicone molds, you do not need to line them. Measure and put water into a pitcher that will now be labeled and used ONLY for soap making. Wearing gloves, weigh and add lye (exact measurement) to water mixture. * Be sure to do this in an area that is safe from pets and children or anyone that may bump it over. Lye mixed with a liquid creates heat and makes the equivalent chemical strength of Drano. Wash immediately if it gets on your skin. Always add the lye to the liquid NOT liquid to lye as this will make it bubble over. Not the mess you want to clean up. While that is 'reacting' and cooling down, combine and heat on low all the oils. If you were to add any scents, you add that last before pouring into molds. Once the oils are combined, turn off heat. Once the oils and the lye mixture (now in seperate containers) are about the same temperature, add the lye mixture to the oils, stir (I use a stick blender) until the mixture gets to 'trace.' Trace feels like pudding when it starts to set up. At this point you can add your scent. In this recipe, .25 oz would be plenty. Quickly transfer mixture to the soap mold. Depending on the oils you use (tallow, lard and other hard fats get to trace very quick) it can take 5 minutes to get to trace or 15 minutes depending on your oils and liquid. Once poured into the molds, wrap a large towel around the soap mold to keep the warmth in. You want it to cool slowly. Typically the following day, you can cut the soap into bars. If the soap is too soft still wait a day or so to cut. Now you have to wait 3 weeks until the lye has been unactived and done its curing. If using a scented oil, scents will become more true as the soap cures. After 3 weeks, its time to try it! The fun part. If you want to mix and match oils (like I do), use the lye calculator below. Some of my favorites to use are palm oil, coconut oil, olive oil, tallow, hydrogenated soybean oil, sweet almond oil, and jojoba oil. It is important to get exact amounts of oils to lye to liquid to make a good bar of soap. It is also helpful to read a bit about specific gravity and understand that oils take up more space than regular liquid. Have fun making your own quality soaps!!! Kombucha! A great tasting detoxifying drink used in Chinese medicine for over 2000 years. Click on the 'News' tab for more information and health benefits of Kombucha. Bring water to boil. Add sugar, simmer until dissolved. Remove from heat, add tea. Steep until water is completely cooled. Pour liquid into glass bowl or jar such as mine. Add mushroom and 1/2 c liquid she is in. Cover the top loosely with a papertowl (I double them up) and wrap with a rubber band. Kombucha should be ready in 7-10 days. Does not taste like tea, more of a very refreshing vinegar background. You can also add flavoring with natural fruit after it is done fermenting. Your mushroom will have grown another mother. This can be used to make other batches. When storing your mother, put her in a small glass bowl or pint mason jar and air tight cover. A single Kombucha mother can be used aprox 10 times. You can peel the mother's apart or keep them together to ferment your next batch. I recommend peeling them apart after your very first batch and store one in the fridge with kombucha liquid (feeding once a month with a 1/2 Tbl sugar). This can be used as a backup in case you have future failures. *Note: you must use white sugar. *Word of caution. As with anything, some individuals may be allergic to Kombucha. Though rare, if you have allergies, start with a small taste. If you react badly use Beet Kvass several weeks to detoxify and then try again. As parents, we assume big name brand companies such as Johnson & Johnson have our children's best interest. But that's not necessarily true. You as a parent do- and sometimes that involves reading what the ingredients are in the things that touch our sensitive babies. These wipes are great for babies bottom and antibacterial as well. The coconut oil provides superior protection and helps to relieve and treat diaper rash. Makes 2 containers of diaper wipes. Put coconut oil, baby wash, and tea tree oil into bowl, pour hot water over indredients. Stir till oil has melted. Cut the bouty roll in half with a miter saw. You can use a kitchen knife but the edge isn't as clean. Remove inner cardboard roll. Pour 1 cup of the liquid into each container (I got mine at Walmart- with a lid that open with a pressure handle at the top, for easy access). A half roll into each container to absorb the liquid. Cover until it all absorbs. Use wipes from the inside first so it creates a consecutive upbringing of the wipes. They smell great too! *You can also use these as soft wet face wipes! Heat oven to 350 degrees F. Cut in half the first 5 ingredients. For apples and squash, scoop out seeds and any stringy insides. Rub with a very little bit of olive oil, place face down on foiled baking sheet. Pour bag of carrots into baking dish and 2 cups water. Cover with foil. Bake Apples for 30 minutes - Bake squash, carrots and sweet potatoes 60-70 minutes. Outside peels should be soft to the touch, carrots should pierce very easily. Take out of oven, let site 10 minutes, take peels off of squash and apples (should just peel off simply). Still hot so work quickly, or use fork to help peel off outsides. Individually blend each kind. I do not mix any but you can and get creative like apple sweet potatoe, carrot apples or a mix of squash. Work in batches-blend with 1/2 cup bottled water. Blend until pureed. Add water if need be, you do not want it too thick and hard to swallow. Put in saved jars/plastic containers and freeze. Unthaw as needed. I try not to use the microwave for too much stuff. I set on the counter to unthaw. My little man is 6 months so these are very introductory foods with little allergens. Pre-heat oven. Combine dry ingredients, mix. Set aside. Combine wet ingredients in seperate bowl, mix. Fold the dry ingredient into the wet ingredients. Dip a paper towel into butter and wipe down the sides of a 5 x 9 loaf pan. Sprinkle flour into the pan and coat all sides. get rid of excess flour (tap into sink). Bake for 45-50 minutes or until a knive inserted into middle ALMOST comes out clean- you will have a little residue on the knife, if it is completely clean, it is not as moist. Cool for 10 minutes, take out of pan and cool another 30 minutes. Stores well for up to 4 days. Pour a cup of coffee and ENJOY. This dishwasher detergent not only smells great but is phosphate free! Non-toxic formula that works wonders on dishes. Works in HE and regular dishwashers. Use a glass container like one shown in the picture. Mason Jars also work great. Mix first 3 ingredients and add lemon oil/extract gradually to prevent clumping. Mix well. Lay on sheet to dry. If you don’t it can be difficult to scrape out of container. Use 2 Tbls. per load. Store with air tight lid. This all purpose cleaner is great on floors, countertops, bathrooms, cabinets, tables...you name it. Peel all fruit. Cut the peels however you would like and throw into 1 gallon or close to glass container with lid. Pour vinegar over the top of the rinds. Mix with a wooden spoon. Air tight cover. Let sit 1 month. Strain the peels and put into spray bottles or whatever all purpose cleaning bottles you would like. Clean like mad. Pre-heat oven to 450 degrees F. Mix all dry ingedients, work shortening in with fork or pastry knife. And milk and mix. Start with 1/2 C milk and add more if you need- mixture should just stick together but not too sticky. Turn out onto floured counter, kneeding a little to get it all together. form into a circle 3/4" thick. Cut like a pie into 8 pieces. Bake for 14 minutes on an ungreased cookie sheet. Serve warm with butter and jam. Pre-heat oven to 350 degrees F. Salt and Pepper filets (sea salt and freshly ground pepper is always best). Place them in a ziplock bag. Mix remaining ingredients and pour into ziplock. Leave for 30 minutes (you CAN skip this part but marinating is always better). Place salmon filets on foil lined cookie sheet skin side down. Drizzle marinade over filets. Cook in oven for 10+ minutes. Depending on thickness of salmon, time will vary. Salmon is done when you can get it to flake away from itself in the middle. Lift salmon away from the skin while cooling. It will not pull away in one step if it cools completely. Serve! all the juices. Slice, Pour the pan drippings over top. *Great served with steamed broccoli and mashed potatoes. 1. Clip candy thermometer (or electronic meat therm - they are super cheap) to rim of 3 qt nonreactive saucepan (stainless steel was once considered reactive but has since been noted it is not, I use stainless). Over low heat, heat milk to 170-180 F. DO NOT let milk come to a boil. Remove from heat and let stand, uncovered, until temp declines to 110 F.
2. Stir a little warm milk into yogurt. Then stir milk-yogurt mixture into saucepan of mlk. Pour mixture into two QT jars. Put lids on loosely. 3. Fill two or three more jars with hot tap water. Place jars of yogurt and jars of hot watter in picnic cooler; cover with a towel. The yogurt needs to be kept warm and undisturbed for 8-12 hours. longer fill hot water jars again and let sit another 4 hours (I never fill water jars more than 2 times- its seems to always be ready). 5. Place inrefigerator for 3+ hours before serving. servings and viola! your own perfect greek yogurt for SUPER cheap.